What came out of the Tsipras-Erdogan meeting? There may have been no clear results on Alexis Tsipras’ work visit to Ankara and Istanbul so far, but these might start becoming more evident in the immediate future, due to the decisions taken both at the private meeting of the two leaders, but also in the expanded contacts between the ministers. An important parameter is that the tension is expected to fall in the Aegean, despite the disagreements that exist on many issues. A day before the visit of the Greek Prime Minister, Turkish Prime Minister Ibrahim Kalin, said “talks would raise issues such as the islands, the Turkish minority in Thrace, etc”. However, in the Tsipras-Erdogan talks, it was decided that a dialogue between Defence Minister Evangelos Apostolakis and his Turkish counterpart Hulusi Akar would take place at the first opportunity of the NATO summit, to escalate and resolve potential tensions in the Aegean. However, it was clear that before the meeting of the two leaders in Turkey there was a communication channel open, as for the first time after 4 years there was no presence of Turkish and Greek ships in the Imia area on the anniversary of the events of 1996. The factor of Panos Kammenos absence from the Ministry of Defense helped to de-escalate the situation, which was also apparent in the talks between the two sides. In relation to the exploratory contacts, Deputy Foreign Minister, Giorgos Katrougalos, stated that “to begin with, they will take place at the level of Secretary-Generals of Foreign Ministers and Deputy Ministers. Defence ministers will also meet on the issue of trust-building. At a later stage, negotiations will involve the foreign ministers. After this preparatory stage, exploratory contacts will begin”. The Turkish side, as was evident in Erdogan’s statements, insists on the issue of the 8 Turkish soldiers who fled to Greece and were granted asylum. 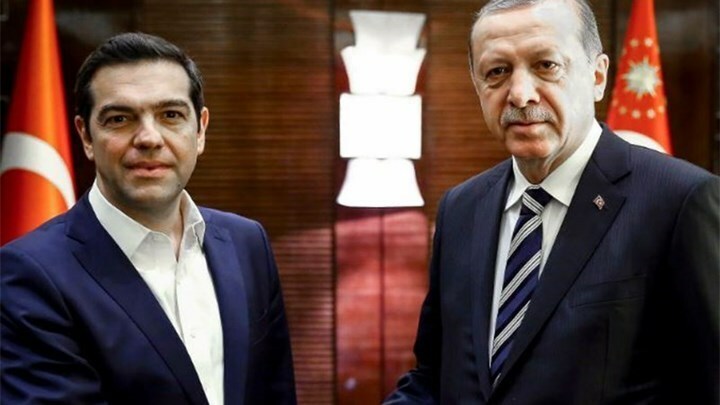 Ankara asks for their extradition, as they are accused of having taken part in the coup attempt, and a bounty was placed on their head by the Turkish government on the day of the arrival of Alexis Tsipras to Turkey. The Greek prime minister clarified that the decision of Greek Justice is respected as it is independent. But the Turks insist on the 8 and ask that they do not leave Greece to another country and not remain free. At the same time, the issue of Gullenists who have fled to Greece was raised, as Turkey accuses them of terrorism. In his statements, Alexis Tsipras said that there would be a mechanism of cooperation so that the terrorists would not pass to Greece, but did not give details. The Halki Theological School and the visit of the Greek Prime Minister has drawn the interest of the media, but Recep Tayyip Erdogan’s statement, who called for a solution to the muftis issue in Thrace in exchange for the immediate reopening of the Theological School, showed how Ankara approaches the issue. According to the Turkish side, the removal of the appointed mufti and the placement of observers in their place is a small step in the right direction. Ankara argues that muftis should be elected and not appointed. In fact there is information that there have been ideas of the election of mufti from the imams, and not from the whole clergy, to the standards of other countries, but so far the difference in this matter remains, but new moves from the Greek side should not be ruled out. However, the presence of Ibrahim Kalin in the Theological School next to Alexis Tsipras and the Ecumenical Patriarch is a sign that the visit of the Greek Prime Minister was made with the consent of Turkey, but also the importance placed to this institution by the Erdogan government. Only the Turkish President Tayyip Erdogan can take the decision to reopen the School of Halki, Deputy Foreign Minister Giorgos Katrougalos told Anadolu. On the Cyprus issue, in his meeting with the Greek PM, the Turkish President Tayyip Erdogan spoke in terms of the reunification of Cyprus. Reports indicate that it was agreed for short preparatory meetings on the Cyprus problem to begin, but neither at what level, nor a timetable was decided. The position of the Greek side is that preparatory meetings between the two sides should begin soon, but at what higher level remains to be seen. The only thing that is known is that they will involve the Foreign Ministries. Alexis Tsipras insisted that the Republic of Cyprus has the right to explorations, but as in the statements made after the meeting, he said that energy could also be a means of cooperation of all sides. The issue that both sides agree on is the refugee problem, as they ask for more EU aid and agree on the co-operation of authorities to reduce flows and increase returns. The flows have fallen from Turkey by 85%, but the overcrowding of refugees in the Aegean is an issue that has been agreed to be resolved by better co-operation in returns.